Compare Tower Fans: Honeywell, Lasko or Ozeri? If you are having problems sleeping at night because your home is not air conditioned or because the air conditioning is not effective enough to reach all parts of the home, or you think that your air conditioning is costing too much, you may want to consider getting a tower fan. They don't require much footprint, and can easily be moved from one room to another. They provide circulation of the cool air even when air conditioning exists in only some part of the home. They save money by allowing to keep air conditioning at lower settings. ​They are usually equipped with a remote control and a rich set of features. Many come in stylish and elegant models that add to the decor of the room. But most of all, they allow you to have a good night's sleep even if your home doesn't have air conditioning, or if the air conditioning is in another room, by allowing good air circulation. You will find below a list of what you should be looking for when you shop for tower fans and a comparison of three of the most popular tower fans sold on Amazon, the Honeywell Comfort HYF013W, Lasko Wind Curve 2554/2551, and Ozeri Ultra 42 inch Wind Fan. Note that these fans were top sellers on Amazon in the tower fan category at the time this article was written and had in general received very good reviews from Amazon customers (an average rating of at least 4 stars out of 5 stars for each!). - At least three speed settings. - Small footprint (from 8 to 13 inches wide) so it can be placed almost anywhere. - Ability to oscillate from side to side to help circulate air across the room. - Timer functionality so you can program the unit to turn itself off within a specified time. - Remote control that allows to remotely control all the functions available on the unit. - Built-in air ionizers/dust filters to keep the air clean and breathable. - Additional air flow settings, such as &quot;sleep/relax/comfort&quot; modes. - Nightlight for easy handling during the night. - Temperature display and adjustable thermostat (note that a fan thermostat does not work like in an air conditioner, it basically blows air until the room reaches the set temperature, and shuts itself off until the temperature goes up again). The three models selected for review here are three of the most popular models sold on Amazon. They provide all the must-haves listed above, and depending on the model, some of the nice-to-haves as well. You will find below a comparison of the three selected models followed by detailed descriptions and recommendations. Note 1: A fan thermostat does not work like in an air conditioner, it basically blows air until the room reaches the set temperature, and shuts itself off until the temperature goes up again. Note 2: The ionizer function helps the air stay clean and fresh throughout the room. Note 3: The Honeywell fan has a 2-hour auto shutoff timer. The Lasko auto shutoff timer can be programmed up to 7.5 hours in 30 minute increments. The Ozeri auto shutoff timer can be programmed up to 12 hours in 1 hour increments. Note 4: The operation of all three tower fans is surprisingly quiet given the amount of power they deliver, and all three fans are almost completely silent at lower speeds. At top speeds, the Honeywell and Lasko fans are quieter than the Ozeri. But when the ionizer function is turned on, the Lasko makes a faint buzz. 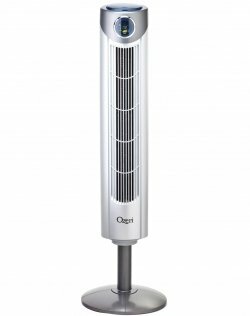 Note 5: The Ozeri Ultra comes with a removable extension column that extends the fan's height to 42 inches. The Honeywell HYF013W tower fan measures 7.48" x 8.27" x 32.21" and brings you comfort in the form of a cooling effect. - Three 3 speed levels. - Oscillation for wide area cooling. It is ideal for medium to large size rooms and is capable of reaching wide and far areas within your home. The auto-off timer frees you from the burden of turning the fan off and saves energy. Regarding noise, the fan is quite y silent in the lower speed settings which still have enough power to cool you off if the unit is not placed too far from where you are. The fan comes with a 1 year limited manufacturer's warranty. The Lasko Wind Curve 2554 & 2551 tower fans measure 13" by 13" and are 42.5" tall. The 2554 and 2551 fans are identical except for their external finish: the 2554 has a partial wood finish, while the 2551 has a platinum color metallic one. ​They utilize minimal space while providing maximum air distribution. They come with 3 quiet speeds and a timer function that can shut off the unit after a programmable interval of time of 0.5 to 7.5 hours (in 30 minute increments). These units are capable of 90 degrees oscillation for better air distribution, and are equipped with an ionizer which can help the air stay clean and fresh throughout the entire room. They also come with a remote control equipped with buttons for all the unit's functions. When not in use, the remote control can be conveniently stored on the unit. Various operations such as selecting the cooling speeds, setting the shutoff time, turning on the ionizer, or selecting the oscillation mode can be done from the unit's built-in panel or using the remote control. Note that these units are not quipped with a thermostat. Because of the partial wood finish, the Lasko 2554 tower fan exudes a sense of class and sophistication that will enhance the decor of any room, but best of all it is is virtually silent. These fans come with a 1 year limited manufacturer's warranty. 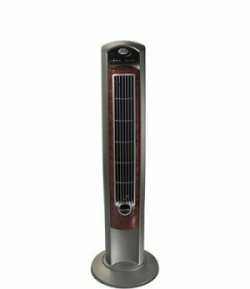 The Ozeri Ultra 42 inch Wind Fan 3-speed digital tower fan measures 7.2" by 9.5" and is 38" tall. It comes with a removable extension column that can increase the fan's height to 42 inches. It is designed to produce powerful air circulation while generating little noise. It comes with 3 speed settings, 3 built-in airflow modes (for sleep, relaxation and comfort), and a 12 hour timer function that can shut off the unit after programmable 1 hour increments. This unit can be set to oscillate 90 degrees for better air distribution. It is equipped with an intelligent multicolored bright LED screen with room temperature display and a light-dimming night mode, and a thermostat. Various operations such as selecting the cooling speeds and the airflow modes, setting the shutoff time, and selecting the oscillation mode can be done using the unit's built-in control panel buttons or using the extended-range remote control that conveniently stores in the fan. This unit boasts stylish ultra-slim space-saving tower design that enhances room decor. Note that no built-in ionizer is specified for this unit. A warranty card is included in the shipment. 1If the priority for you is having a powerful unit that will cool down your room fast, then the Honeywell or the Ozeri should be your choice. Compared to the Lasko fan, they are capable of blowing and circulating more air. The Lasko is the least powerful of the three, but that doesn't mean that its air circulation ability is inadequate. The Lasko air circulation feels like a nice gentle breeze which is more than adequate for most people. Otherwise, the Lasko would not have been one of the most popular among Amazon buyers. However, those who like really strong air circulation might want to consider the Honywell or the Ozeri. 2Regarding noise, it is worth noting that, given the amount of power they deliver, the operation of all three tower fans is surprisingly quiet. All three fans are almost completely silent at lower speed settings. At top speeds, the Honeywell and Lasko fans are quieter than the Ozeri. But when the ionizer function is turned on, the Lasko produces a faint buzz. 3Though the Honeywell and Ozeri have nice looking designs, if aesthetics is very important to you, you should consider the Lasko which is the most stylish and the most aesthetically pleasing of the three models. 4The ionizer that comes with the Lasko fan is very efficient in keeping the air clean and avoiding breathing related allergies. Note that the Ozeri product specifications do not specify the existence of an ionizer. 5The adjustable height of the Ozeri fan is quite useful and does not exist in the other two products reviewed here. When fully extended to 42 inches, it has the ability to affect specific areas such as the air closer to the ceiling where the rising hot air prevails. This is an important consideration for spaces that have an open mezzanine/loft area. 6The electronic timer that comes with the Lasko fan can be set in 30 minute increments and provide more flexibility than the timers that come with the other two brands which can only be set in increments of one or more hours. 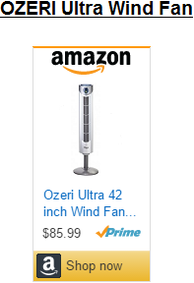 7Finally, if price is a consideration, based on the Amazon list prices, the Ozeri tower fan is more expensive than the Honywell and the Lasko, the Lasko being the least expensive. However, Amazon often provides a discount on the list price, and therefore for the actual prices of these units please refer the following section. You will find below, on Amazon, the three tower fans compared in this review. Note that Amazon usually gives a good discount on the List Price. If a discount is available, it will be shown along with the List Price when you click.